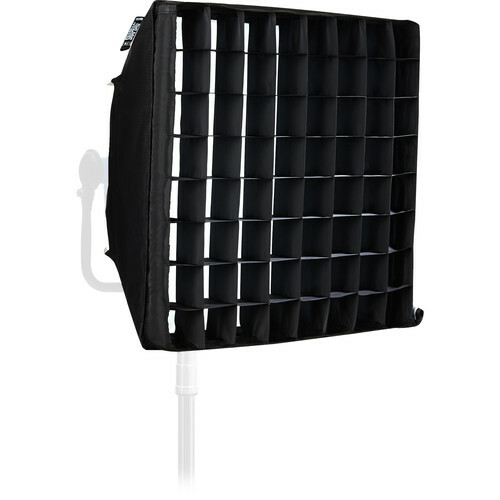 Size: 23 x 23 x 3"
Take control of the light spread from your SnapBag S30 and SkyPanel S30 LED Softlight with this DoPchoice SnapGrid from ARRI. Able to be mounted directly to the front of the SnapBag via hook-and-loop fasteners, this 40° grid makes it easy to set up and take down. Also, it measures 23 x 23 x 3" and can fold down for easy storage. Additionally, it comes with a carrying bag. Box Dimensions (LxWxH) 17.5 x 4.6 x 4.3"
DoPchoice SnapGrid 40° for SnapBag S30 is rated 5.0 out of 5 by 1. Rated 5 out of 5 by Brandon S. from Nice addition for the light. Like with any chimera having a grid is nice. Easy to add on worth having with the light.